Power Wraps are a unique product that turn your standard power cord into a true high-end power cable. Power Wraps are a very effective noise suppressor for all AC power cords. They allow you to use the AC cords that the equipment manufacturer provides and still reduce the noise from the AC line to your electronics. You can improve AC cords even if they are non-detachable. One of the main entry points for noise and radio frequency interference (RFI) into an audio system is through the AC power lines. Filtering the audio frequency noise is generally handled in power supply filtering. However, the RF noise is harder to filter effectively. 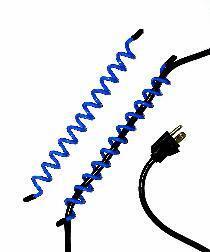 Power Wraps use a patented RF absorber in a special configuration developed for use on AC cords. The RF absorbers filter the RFI and kill the ringing in AC cords. Power Wraps provide unique benefits that cannot be achieved any other way. Audiophiles try to correct for the sonic degradation of power line problems in a variety of ways with varying success. Power Wraps strike right at the heart of the problem and also give the most cost-effective solution. Tuning (the positioning of the Power Wrap along the power cord) can optimize the performance of the Power Wrap. The AC cord has several fundamental ringing modes and many harmonic ringing modes resonating all the time. The position of the Power Wrap along the cable will determine which main modes and which harmonic modes are suppressed. The modes and frequencies that are suppressed will determine the sonic signature of the AC cord. The most important AC cords to tune are the cords on the Digital Transport and the D/A converter (or the CD player). There is a double benefit from suppressing noise in the digital equipment. Power Wraps reduce the RF noise into the digital equipment and also reduce the digital noise fed back into the AC line. The source equipment should always be the first to be tuned, because once noise is introduced into the system, it will propagate throughout the system. The digital transport and turntable benefit greatly from noise suppression. Once the source is tuned, add Power Wraps to the other components. Experiment for the best results. Power Wraps also benefit audio and video interconnect cables. They improve the performance of low- and medium-priced cables for less than one would spend on a more expensive cable. They are especially helpful on non-shielded cables. The All Clear version of Power Wraps has a smaller diameter, which is more suited to interconnects.